Christmas 1986: I am two years and two and a half months. My dad is twenty-five. I’m not sure when this is, but I know I was washing the car so probably summertime…of ’87? I woke up really early this morning for no apparent reason…like 6:45. Ali was up and busting around though, which she usually isn’t in the morning so maybe that was it. I took out the garbage, something Tony usually does but forgot to last night (when he came to bed at 2:30). I can’t open the garage door so I’m sure I was quite the site lugging the garbage can out the front door at 7:15 in Tony’s sweatpants and t-shirt. It was nice to be up and somewhat "about" for that early time of the day. I’ve forgotten how much I enjoy and, to a degree, thrive off that quiet peacefulness. It reminds me of getting up at five for Subway the last year and a half. Getting there by six, and having to use the bus system to do so, was often a trial (especially through a Seattle winter) but I know I’m a stronger person because of it. There’s also a very specific sense of calm that comes at 10am knowing you’ve already logged four hours of hard days work. And that you will get off before the dreaded darkness sets in! So now it’s almost noon and I resent the world joining me with all their noise and bustle. I am, however, happy that it’s Friday, that Tony is finishing Ironmaster today and that he can de-stress for a couple days. I’m also hoping the clouds burn off soon so maybe I can clean my car. I spilled a smoothie I made with ice, yogurt, chocolate Carnation breakfast mix and a banana in there….um, a week and a half ago? I wiped it up with a towel but was late to class and it’s been grossing me out ever since. It’s stuff like that, when I’m not exactly sure HOW to clean it, WHAT to do that a) I tend to ignore the problem and b) feel very inadequate and childish. When did I become a grown-up? Eighteen? Twenty-one? When I left for college? When I began supporting myself? When I got my own apartment? When that stick read positive? Woah…..super deep. I’ve often pondered when I became an ‘adult’. I’m not sure when it happens. I know I FELT like one when I voted for the first major election and again on my wedding day (I was 19), but looking back I now realise that I was majorly immature in many ways (I thank God that Ben was so gracious and loving).Maturing is a continual prosses, made possible by God. I know of several people that are in their 40’s and have teen-age problems…..ah the joy of living! You just do your best and lay the rest down at Jesus’ feet, at least that’s what I do. I hope this didn’t sound to ‘preachy’! Much love to you this evening! Kt P.S. Sorry, my spelling stinks! Forgot to say……CUTE, CUTE, CUTE photos! 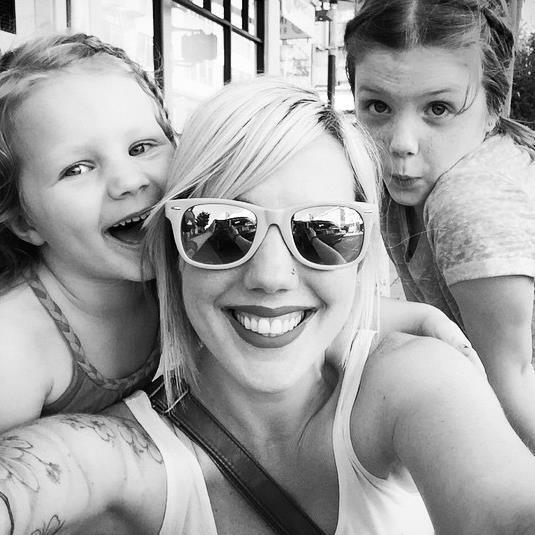 Mother to two school-age daughters, wife to the Father of Every Year, social worker in the domestic and sexual violence field by day and writer by the wee hours of occasional mornings. The Privilege of Vulnerability | Ashley Lewis Carroll on Why I can tell my boss I have a drinking problem and am going to rehab. Julie on I Present Myself. © 2016 Ashley Lewis Carroll. Please contact author for reprint permission.